I have been working on developing the Phazes Circuit program for many years. Fine tuning and tweaking an exercise program that is convenient, safe and effective for anyone at any fitness level. 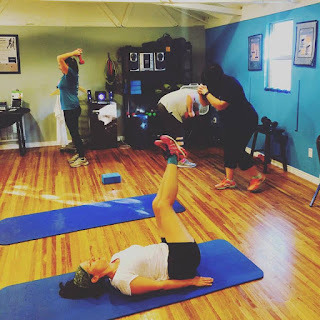 I have tried EVERYTHING under the sun, Crossfit, Curves, Insanity, P90X all the workout videos you can imagine, every fitness class I could get into, personal trainers and a variety of bootcamp style trainings. I worked in a gym setting as a group fitness instructor and a personal trainer. In all of these settings, I was just not completely sold on any program. I studied for a long time before I settled on what needed to be done to solve all the issues I had with so many other programs. Some Programs were great at pushing at High intensity, but lacked a starting place for REAL beginners. Some were too competitive and created an environment that belittled others, Some were great for beginners but had no place to grow to as you achieved more. Some were just inconvenient. I hated when people came in late and cold to a group fitness class and jumped into the middle without a proper warm up. I hated Fitness classes that caused soreness so bad that clients couldn't walk for a week. I hated the meat market at the gym and the waste of time going from machine to machine for 90 minutes. In fact I hate 90 minute workouts in general - just because It's hard for me to find 90 minutes. I also found workout videos were easy to turn off, Personal trainers were too expensive for the average Joe, and many gyms only have staff that have a great smile and are there to sell you something, not help you get results. I liked... having a trainer available included in the cost of the program that could correct your form. I liked convenience of coming in when I could - not a set class schedule. I liked Body weight based exercises that challenged the entire body. I like short intense workouts that could be done in under 30 minutes. I liked changing workouts and not doing the same exercises every time. I liked getting a workout mastered and not having it changed TOO soon on me either. I liked being accountable and I liked being challenged. I like paying Gym membership prices for everything I liked. I liked REAL starting places for SUPER beginners. I liked feeling like MY workout was good enough for me - not some competition. I couldn't find what I liked out there anywhere. So I created it. The Phazes 40:20 circuit has been known by many names over the years. But no matter what the name, the 40:20 circuit is the best workout for about 90% of the population. Why 40:20? Well, you do an exercise for 40 seconds and rest or get ready for the next exercise for 20 seconds. There are 12 stations around the Phazes Studio, or 12 exercises on our videos of the 40:20 workout. You will do each exercise on YOUR fitness level. In the Phazes circuit we help you modify or challenge yourself to get YOUR workout. There is no RX or prescribed Numbers or weight to be doing. You do what challenges YOU - not the beast that created the workout. Maybe you can do more maybe less? As long as you are getting a great workout - that is what matters. Pushing to someone else's idea of where you should be working at before you are ready is a recipe for exercise induced injuries. Silver level: is what you take if you are a beginner, need a gentle place to work or have injuries or any other limitation that require a gentle approach to fitness. Challenge: This is for the elite athlete that LOVES that intense push. There are more intense variations on exercises that include Higher impact movements, greater range of motion and increased weight. We got you. The 40:20 circuit is worth checking out. do as many rounds as you have time for or that you can handle. As each level gets more and more easy, go to the next level and challenge yourself to see what you can accomplish. n needed. but Since you have a trainer near, you will still be working hard without giving up.